The myth of the Old West cast a long shadow over the first century of filmmaking—in fact, I once had a history teacher who insisted that the combined runtime of every western movie would easily dwarf the amount of time this era actually existed. Despite this, the genre has only occasionally intersected with horror, and even then, it’s more likely that the latter has simply adopted a Western aesthetic (i.e., Near Dark). Films where honest-to-god 19th century cowboys bump into horror elements are few and far between, but leave it to Charles Band’s Empire Pictures to transform a dusty Old West backlot into a theater for slashed throats and skeletal zombies in Ghost Town. A curious no-budget dispatch from the end of Band’s run at the studio (he would sell it off in 1988 before founding Full Moon), Ghost Town is a Twilight Zone episode without a hint of any social commentary. Arizona’s hill country looms large, dwarfing a lone car driving down a desolate highway. The driver is Kate Barrett (Catherine Hickland), a runaway bride tearing down the road with reckless abandon until a mysterious dust cloud engulfs her car. Hours later, the town sheriff stumbles upon her abandoned, battered car and deploys deputy Langley (Franc Luz) to investigate. Soon, the sound of horses hooves clatter by as the same haze surrounds him and transports him to an actual ghost town. Seemingly content with the very idea of its high concept genre blend, Ghost Town unfolds rather lethargically and obliquely. Viewers watch as Langley staggers through this old town in pursuit of a gunslinger atop a black horse, apparently oblivious that he’s wandered into another dimension. The obvious sight of a centuries-old western town—complete with a blacksmith, his daughter, and an old time saloon—hardly fazes him. It’s not until an eerie crowd appears and quickly disappears from his sight in the saloon mirror that he begins to suspect that something is off. And even then, he still just continues to casually stroll through the town, perfectly convinced his shotgun can solve problems with the local roughnecks led by Devlin (Jimmie F. Skaggs), a hideously scarred outlaw that’s been terrorizing the town for, oh, about 100 years now. To put it mildly, Deputy Langley is slow on the uptake but infused with a dopey sincerity by Luz, who is tasked with drifting through an aimless, obtuse script. Director Richard Governor at least provides plenty of visual distractions from the underdeveloped story. Ghost Town is a film of moments, and, while they don’t reach hallucinogenic or delirious highs, they present an array of ghastly and lurid visuals. The skeletal remains of the old town sheriff bursts forth from the ground to greet Langley as he enters the town (somehow, this does not alert him to any supernatural chicanery), while the climax is a blood-soaked affair, full of victims necks sliced ear-to-ear and rotting, worm-ridden corpses. Sandwiched in between is the film’s most dynamic and illuminating sequence: a pivotal showdown between Devlin’s gang and the ill-fated town sheriff that ends with the latter being crucified on a windmill and buried alive. Langley can only look on helplessly before realizing he’s encountered a bit of eternal recurrence—it turns out these shades have been repeating themselves for a century, trapped in a cursed limbo that will only end once someone avenges the sheriff’s cruel death. An existential despair surrounds the townspeople, many of whom seem to be aware of Devlin’s 100-year reign of terror over their souls. It’s the closest Ghost Town comes to feeling genuinely unsettling, but it’s obviously something it has little time for, what with all the impalements and shootouts that occur once Langley decides to play savior (the runaway bride from the opening also plays a role, albeit an arbitrary one). 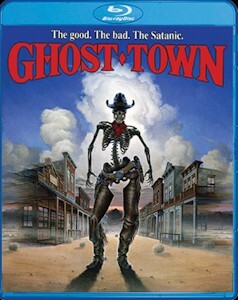 For better and for worse, Ghost Town is a quintessential Empire Films production: inspired by the kernel of a cool idea (that would lend itself to a cool box art to help it leap off of video store shelves, naturally), its script is undercooked but manages just enough entertaining moments to give the film a pulse. Because the effects are gruesome and Skaggs is a lively scoundrel, the film works when it absolutely has to during a scant 84-minute runtime that doesn’t demand much. Even the downtime isn’t too sleepy, as Governor and cinematographer Mac Ahlberg bathe this vintage backlot in ominous sunlight to accent the dreamy artificiality. Crows flit about, perching near tombstones, heightening the dread, desolate atmosphere expected of a movie called Ghost Town. It should be noted, however, that the film does have trouble living up to its box art, as it doesn’t deliver any skeletal gunslingers; but, then again, you almost expect this as well considering the source. That cover art returns to adorn Scream Factory’s Blu-ray release of Ghost Town, which marks the film’s first home video release since the VHS era. Obviously, the high definition transfer here is an upgrade—in fact, considering its extremely limited its theatrical release (Box Office Mojo reports that it only opened in eight theaters), this is likely the best the film has ever looked to most audiences. Likewise, the sound is adequate enough, and, while there are no supplements, this is one of those cases where it’s nice just to have the film at all. It’s a title that’s routinely popped up in the “not-on-DVD” circles and piqued my interest for years (and, with that cover art, how could it not? ); it’s always nice to be able to strike another film from this list, even if it is something like Ghost Town.